Make no sense or have no sense? When can I say have no sense and make no sense? Is have no sense ever correct? I tried to explain to him that this situation just have no sense. Can you see what the problem is? In fact, he has made two errors in one. The first is a verb agreement error, and the second is a word choice error. The subject this situation is singular, and so any verb that follows it should take an -s at the end in order to make it agree. We call this kind of error a third person singular agreement error. Here is the correction for this kind of error. I tried to explain to him that this situation just has no sense. The second problem is a little harder for learners to fix on their own. The reason is that you need a wide exposure to English or a corpus to work out the rule. Can you say have no sense? As you can see, there is one example of have no sense in the phrase have no sense of shame. It is less common than make/makes/made no sense, but it is definitely possible. 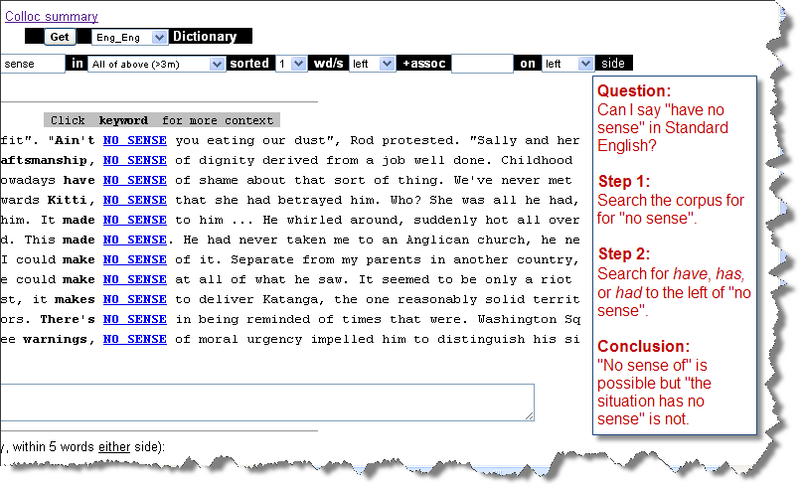 In developing error detection rules for the Virtual Writing Tutor (the ESL grammar checker) anytime a learner submits have no sense or has no sense, the system will alert the learner to the word choice error and suggest “make” or “makes,” except when followed by the word of. Try it yourself. Copy and paste any one of the following sentences and paste it into the text area of the Virtual Writing Tutor to see what it says. I tried to explain to him that these situations really have no sense. I tried to explain to him that this situation really has no sense. I tried to explain to her that he have no sense of shame. I tried to explain to her that he make no sense of shame.